Spending the day on the brilliant waters of the Cayman Islands is one of the top things to do here. The calm seas plus the beautiful crystal blue hue of the ocean makes for a memorable occasion and for some outstanding photographs. Many of our guests like to book a Cayman Islands boat tour to experience the cool breezes and stunning sights. Whether you choose to go on a boat tour in the North Sound or sail around our islands in a different location, there is so much available to enjoy. Most boat tours of the Cayman Islands travel in the North Sound, an area of water that encompasses 35 square miles and is protected by a natural reef. This idyllic local is perfect for boat tours that allow riders to hop off for a bit of snorkeling. The North Sound is also where you’ll find Stingray City, the world-famous Cayman Islands attraction that puts tourists and locals up close with some of the planet’s most fascinating creatures. What Type of Boat to Cruise On? The Cayman Islands is host to many boat tour companies who can show you the sights privately or in a group setting. There are also many options for short hour-long boat rides and all-day adventures. Private charter boats give you the option to choose where you want to go and what you want to see. You create your own itinerary and sit back and enjoy the experience while your professional boat captain takes you to customized places around our islands. Group boat tours of the Cayman Islands don’t offer the exclusivity of having a boat to only you, your family and friends in most instances. But they usually cost quite a bit less than a private tour and they allow you to meet new like-minded people. Many of the boat tour companies pick up and drop off at Seven Mile Beach, a top beach on Grand Cayman and one of the best places to relax near South Bay Beach Club. From South Bay Beach Club, we recommend setting off to sea with these three Cayman Islands boat tour companies and several others we’ll be glad to tell you about when you stay with us. Stingray City boat tours typically consist of three-hour-long trips to the clear waters known as Stingray City. Many island tour operators take visitors and Cayman residents out on these tours that sometime include snorkeling at Starfish Point and sitting down to lunch at Rum Point. Stingray City is home to roughly 90 gorgeous Southern stingrays. 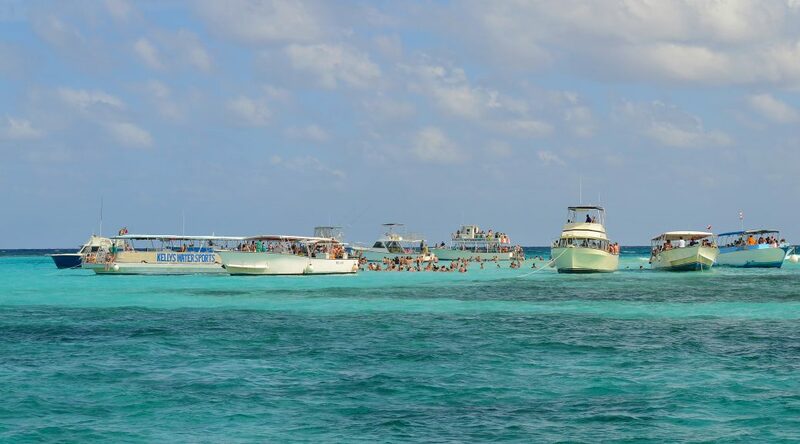 Grand Cayman boat tours frequently include a snorkeling component at popular sites like Cemetery Beach, Smiths Cove, Cheeseburger Reef or Wreck of the Cali. Our sister islands have some amazing boat tours where you can snorkel through mangroves and in the pristine waters that surround Grand Cayman. There may not be a sight more incredible than a Cayman Islands sunset, and some of the best of them occurring within plain view of the waters of Seven Mile Beach. If you only take one tour while staying in the Cayman Islands, consider a sunset cruise on the Caribbean Sea. Gaze at the radiant sun as it sets into the scenic ocean and enjoy one of the vistas that we Caymanians get to take in every day. Ask us about other Cayman Islands boat tours like luxury yacht tours, sailing school tours, and bioluminescence tours.